"During culinary school I worked at a Mexican restaurant in Saranac Lake, NY, called Casa Del Sol. My favorite dish was the Chile Verde. 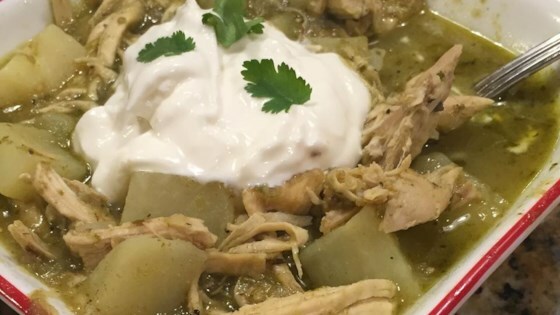 In this version I simmer large chunks of chicken slowly in an exotic green sauce of tomatillos and chilies." Season chicken pieces with salt and black pepper on all sides. Heat 1 tablespoon vegetable oil in a skillet over medium-high heat. Cook chicken, 2 to 3 pieces at a time, until browned on all sides, about 15 minutes total. Set aside. Place tomatillos, jalepeno peppers, garlic, cilantro, and chicken stock in a blender and puree until smooth. Set aside. Heat 1 tablespoon vegetable oil over medium-low heat in a Dutch oven. Stir in onion, cook and stir until onion is soft and translucent, about 10 minutes. Stir in cumin, oregano, and bay leaf; cook 1 minute. Place chicken over onion mixture in the Dutch oven. Pour in tomatillo mixture. Bring to a boil, decrease heat to low and simmer, covered, until the meat is tender and falling off the bone, about 1 hour 15 minutes. Stir in potatoes and cook, uncovered, until they are easily pierced with a fork, about 35 minutes. Season with salt and pepper to taste; serve garnished with sour cream. What a disappointment. Bland. Will definitely not make again. Something was missing in the flavor. Had to do a lot of fussing to get my taste buds happy.